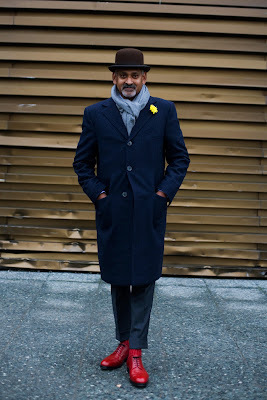 Comments on "On the Street....Yellow Flower, Pitti"
You gotta be kidding me! I mean that in a good way. He looks like an undercover-clown; but in a good way! The shoes-socks take guts and complete assurance, which he has. Wow - he looks fantastic! The primary mix works so dramatically! What really makes it for me are the socks. Perfect match for the shoes, and they draw just a little extra attention down there with the ankle-length pants. The overall of the primary colors is lovely. yea!!!!! He's so cheerful! What a wonderful person to encounter on a winter day. Thanks for sharing. I love the colors of the whole ensemble. The scarf looks nice as does the bowler. Everything compliments each other. I really like the length of the pants in this instance. It is really playful. Such whimsy! Such levity! A charming reminder that life springs eternal. It's kinda clockwork orange...but in a good way. Nice combo. I adore his sense of color (the light blue scarf, nice red shoes and vivid little yellow flower), the length of the pants is somehow working well with the coat, too (I usually find that length a bit tricky), great background contrast too! Perfect. Boho style writ large... I mean LARGE. I met him once in Duesseldorf and talked to him for a couple of minutes. He always wears these red shoes and shorter pants. Individualist, but very stylish. I love the yellow flower and the red shoes fantastic. He looks great if you don't look at his trousers. I have never been a fan of the Thom Browne look. I love the flower on his lapel, and the red shoes are interesting. Interesting pic, Sart. The trousers here are much too short, as other commentators have pointed out. And the colour of his socks and shoes? Bloody hell, NO! It simply doesn't work. Progress not perfection, I suppose. That's not a Thom Browne look!Mr Browne always forgets to put his socks on. Back in the 1980's I was a bit of a skinhead, and this gentleman's appearance reminds me of those days, with a Crombie-esque overcoat, cropped trousers, and a shoe-and-sock-combination that looks at first glance like the oxblood Doc Martens we used to wear. That bowler makes it look even more English. Color combination is quite nice. However, I love the bowler. The flower is small enough to not be distracting. A very nice look. have you posted this picture before? or was it in gq or something? It looks remarkably familiar. I love the images wherein men really are really using color effectively. Why should women have all the fun? This picture made me smile, and I was having a bad day so far. Thank you sir. Those shoes are incredible! I also appreciate the little yellow touch that makes a wonderful look! Hating the red Ronald McDonald size clown shoes. To me it is totally distracting from an otherwise charming look. Great..till you get to the shoes, which add an unnecessary dose of Ronald Mcdonald. i love this! dress-y with a fun touch of color. how charming. this makes me happy. The shoes and yellow flower shine in the beautiful hues of navy and blue. And they look good on him. He looks remarkably like a sad clown to me. It works, though in an odd way. That's a FUN look. He's got a sense of humor in addition to a sense of style. Yes, I agree with the person who said the shoes have to go. Not a fan, but the rest of the look is charming. i adore this outfit on him. it seems so sweet and suits him to a tee. do not even think of messing with this guy. seriously. i give him untold kudos for wearing a propoer man's hat, and a bowler at that. it's a lost art these days. and that flower,in winter? c'mon, how can you deny this guys level of coolness? LOVE the shoes - mmmm, red! and... i think i spy a south asian man, possibly the first i can remember seeing here! what a cutie. he looks so cheeky! love it all - the shoes, the flower, the scarf...very cool and at the same time quite distinguished! My baby's first pair of shoes were red. Red shoes to me are joie de vivre. And here, he has placed his feet just so, because he loves his red shoes! Adorable! He is straight out of a fashion fairytale. Sart, you should come to mumbai. The streets are full of people dressed like this. "The guy is Ignatious Joseph, the guy behind http://www.ign-joseph.com/"
Ooooooh, it always makes me kinda sad to find out that these wonderful individualists are models or designers or otherwise connected to the fashion industry. This picture made me much happier when I imagined that this was just an anonymous little man enjoying his quiet life with a happy and benignly defiant flare. It's a very playful look. I like it. Those shoes put him awfully close to joker territory. the dark, deep, mystic colours on him are there...BAM, there's the shoes & the flower..
now THAT's a "fashion landmark !" the shoes could be more subtle, everything else is immaculate. He has the proportions right. So perfect for a gray winter day. very sophisticated. great shoes !!! This gentleman has a great sene of both style and humor. The brown derby is the perfect somber foil to the outlandish (in a good way)shoes. I love everything about brim of the hat--the color, the direction to the viewer. His shoes and socks are fantastic! wow, I'm so taken by this man. Sart??!! ARe you here in Hong Kong!! you didnt tell us!! - but the SCMP has!!! Can't see what there is to love!? Although his outfit is nice, you can't see it because of his awful clown shoes. The hat color doesn't go with his face either, for some reason. Btw, has red shoes EVER been nice??? The red shoes spoil it. They look clownish as others have commented and they attract the eye away from his nice face and the good tailoring of his coat. It makes me feel happy just to look at him. I'd love to follow him all week to see what he wears. He belongs in a film - so bold and confident! A beautiful, colorful look that retains all of its masculinity. Could he possibly be any cooler?? Love the way he combined those primary colours. I wonder what his profession is. His name is Ignatious Joseph and he owns the ign.joseph label, a Switzerland based high end shirt company. the whole silhouette looks so modern. and balance of colours with primary spots works perfectly! Absolute fabulous, sophisticated whimsey, and the red shoes would never work without the yellow flower -- the artful piece-de-resistance. Loved the yellow flower and his red shoes. Gee, these shoes are fabulous. I wish I had a pair of them. this dude has major balls! Oh, I enjoy this visual very much. Really, it's the hat that brings it all together. i love it! he just makes you want to smile! Isn't that mr. Ignatious Joseph? I love that he has rolled his pants up to reveal his red socks..which perfectly coordinate with the yellow flower. I want to see what he is wearing under his coat.. I love rich color and he does it really nice. Oh my gosh-- this is fabulous. I love the color choices he made-- the yellow flower and red shoes contrasting the blues. Very original, yet classy. He pulls it off. At a glance, the yellow flower looked like the yellow star of David to me. Utmost class. It is, I think ,the frist time that I LOVE short trousers. He is beautiful and all the shades of blue look heavenly. I was clicking through the whole website and there are so so many pics of older people that are dressed like models!! Wow! I'm very impressed! the red shoes are so stunning, and also the yellow thing on his coat.